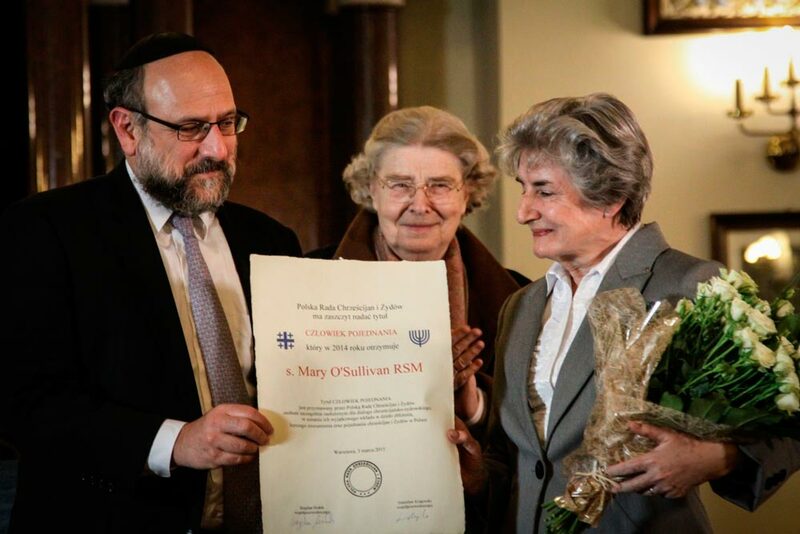 The Person OF RECONCILIATION title is awarded by the Polish Council of Christians and Jews, to people of particular merit in Christian-Jewish dialogue, in recognition of their contribution to a better understanding and reconciliation between Christians and Jews in Poland. Sister Mary O'Sullivan RSM [Religious Order of the Sisters of Mercy] belongs to the Sisters of Mercy Dublin (Ireland). Since 2009 she has worked in the Krakow Foundation Centre for Dialogue and Prayer in Auschwitz. The Centre is engaged in Christian-Jewish dialogue and she keeps contact with English speaking and Hebrew speaking guests. to be here tonight, to be here in Nożyk synagogue is a great privilege. I am trying to grasp the significance of being in this synagogue with its story and its memory and of being part of the wonderful events of this evening. 1. I want from the bottom of my heart to thank you, the members of The Polish Council of Christians and Jews, for the honour you have bestowed on me and to you Stanisław for your gracious words. To my religious sisters Peggy Collins and the Team in Dublin with me in spirit, to my brothers who are here from Dublin, to friends who have come, to all of you, a big thank you. My little encounters in Jewish-Christian dialogue take place mainly at the Centre for Dialogue and Prayer in Oswiecim, “at the edge of Auschwitz”. I want to thank Fr Jan Nowak, the Director of the Centre, Fr Manfred Deselaers and all the wonderful people working at the Centre for making it a great place of hospitality. Listen to the voice of G-d, take serious the religious questions and prayer. These have been like a road map for me and I share them with groups and individuals as an approach to the memory of Auschwitz. 3. I would like to share some experiences to demonstrate what dialogue at the edge of Auschwitz looks like. In the days during the recent 70th anniversary of liberation commemorations at the end of January many former prisoners, both Christian and Jewish, stayed in our house. I witnessed the conversations and watched the survivors roll up their sleeves to show the numbers on their arms, exchange dates and years of their time in the camp and recount their stories with each other. They had a sense of life, humour, and wanting to talk. With them were Avi and his grandfather David who is a survivor of Auschwitz. Meeting children and grandchildren of survivors is an experience I’ve never really had before, and it has been so eye-opening. I would come down to the lobby each night expecting to quietly check my email, and I would routinely go to bed at 2 or 3 in the morning because of the new people I was meeting. I never expected that I would be walking away from my time here with these new friends and intimate connections. I heard these other people retell their family history, and how their families have incorporated and dealt with this massive trauma. We all have survivors in our family. Their stories are our stories. When my grandfather is gone, his story will be my story. Even now, it is a part of my history. It always will be. As cantor, David chanted the haunting El Malei Rahamim at the 70th anniversary commemoration. On another occasion Michael came with an interfaith group of Jews and Christians for lunch in the Centre. He told me his family were originally from Chmielnik, and he was going to visit the town where they had once lived before the terrible events of the Shoah. I had been there the year before for the Jewish culture days, and had a book about the Jewish community of the town which I gave him. He left, but within five minutes he was back and very emotional. He opened the book and showed me the names and pictures of some of his family members. A few months later he wrote to say he had been received very warmly by the president of the town, met the author of the book, was brought to places associated with his family, visited the synagogue and Jewish cemetery. The Fine family of four spent some days with us. With no immediate family connection to Auschwitz the parents wanted to share this very painful part of their Jewish heritage with their children. We spent a little time together every day. Before leaving the Centre, Mrs Fine said, “It felt like home to us here”. What the Centre offers is a welcoming atmosphere, a place of hospitality where people feel safe, accepted and respected with their own identity and wounds; where they can reflect, talk to someone if they so wish. I think people sense and feel this atmosphere very quickly. 4. The healing of relationships at the edge of Auschwitz is a slow process and takes patience. We are told in the bible that Job sat silently for 7 days and his friends came and sat with him. Please all of you pray with me for the patience of Job in our dialogues. The final word comes from Leon a survivor of the Będzin ghetto and Auschwitz. We were together for breakfast the morning of January 28th. He looked at me and simply said, “You will never understand what it was like here, nobody will.” And this is true. I have never been a survivor and so will always understand only a little. But this ‘little’ opens a door to creating the opposite of Auschwitz, a world of mutual respect and love. This already is an answer after Auschwitz, an answer after Nostra-Aetate and is for me the mystery of the transforming power of Auschwitz today. Dziekuje bardzo, todah rabbah, Purim Sameah, go raibh mile maith agaibh, thank you.